What’s the one smell that drycleaning can’t remove? Mothballs. 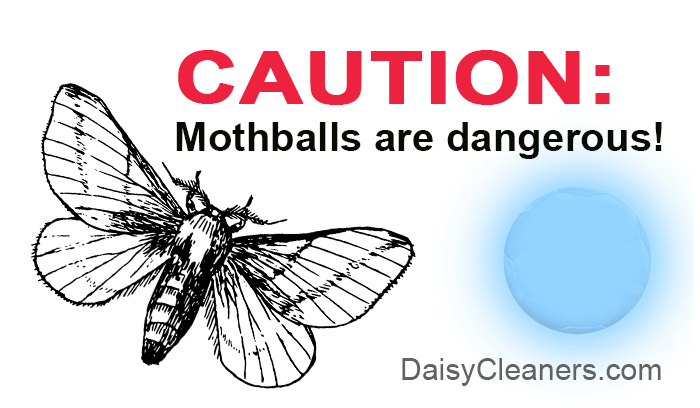 And mothballs aren’t just stinky, they can actually be dangerous to you and your family! Mothballs contains the chemical naphthalene, which is very toxic and may raise your cancer risk. Besides the vapors being dangerous to breathe, it’s also dangerous for to skin to touch the chemical residues on fabric that has been exposed to mothballs. For more information about the danger of mothballs, see “The danger in mothballs” by Sari Harrar, published in the Philadelphia Inquirer. 1. Moths and other pests are actually attracted to soils on your garments, not the fabrics themselves. Get your clothing professionally cleaned before putting it away into storage. 2. Both Cedar and lavender are safe, natural pest-deterrants. See The Basics of Mothproofing from Martha Stewart’s blog.